Few post ago I have touched the zone setting in web interface. Now this lead to groups. This setting combines multiple sources into one object. Such object consists of zones, authentication units and sensors and represent them to outside world. This allow you to set different alarm settings for your house and for your garage. For example you can have your garage armed and monitored while you are sleeping in your house, just by setting corresponding zones in garage into separate group. 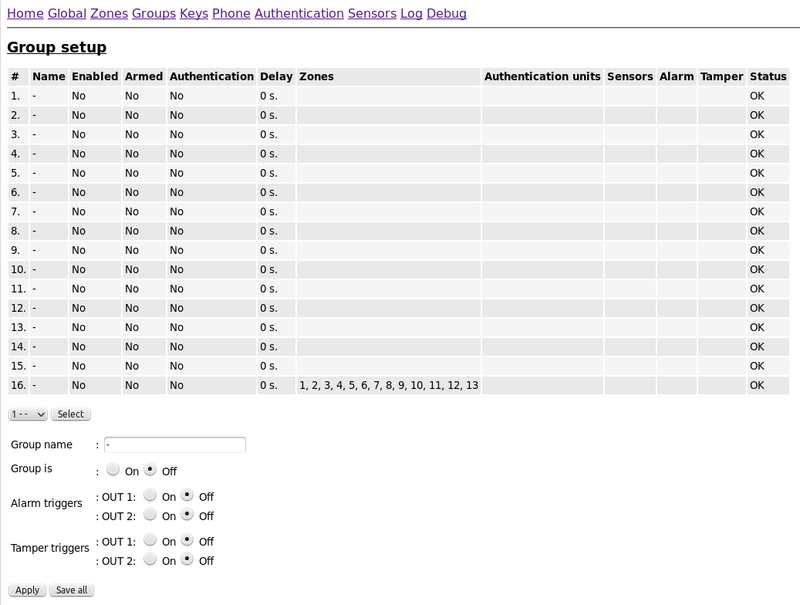 On this page you can also see what authentication units are allowed to arm and disarm particular zones, and also you can see sensors that are attached. The group itself does not have too much settings. You can set the group name, set it On or Off and assign a output trigger for PIR and tamper event. All other parameter are taken form their respective sources like zones, sensors and such. But group setting offers great overview of what is going on in your system. You can see the group status, if it is armed or alarm is tripped and how long we are waiting for the authentication. There are 16 groups not only to differentiate zones, but also to distinguish location of sensors and to allow proper MQTT propagation. More on this topics soon.